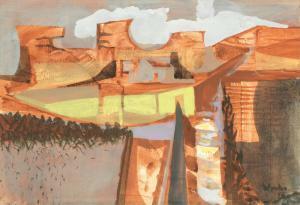 Find artworks, auction results, sale prices and pictures of Bryan Wynter at auctions worldwide. 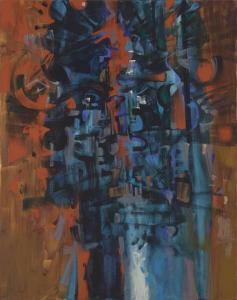 Bryan Wynter (1915-1975) High signed, inscribed and dated 'BRYAN WYNTER/"HIGH" 1960' (on the reverse) oil on canvas 60 x 30 in. (152.5 x 76 cm.) Painted in 1960. Provenance with Galerie Charles Lienhard, Zurich. with Waddington Galleries, London, where purchased by Mr Dessargues. Anonymous sale; Sotheby's, London, 24 October 2005, lot 97. Bryan Wynter (British, 1915-1975) Sea Journey oil on canvas 142.3 x 111.8 cm. (56 x 44 in.) (unframed) Painted in 1958 Footnotes Provenance Dr. Damiano Design Research Unit, London Sale; Christie's, London, 26 October 1994, lot 155 Williams & Glyn Bank Paul Bedford With Robert Sandelson, London Private Collection, U.K. Exhibited London, Waddington Galleries, Bryan Wynter, Recent Paintings, 10 March-4 April 1959, cat.no.15 London, Arts Council of Great Britain, Hayward Gallery, Bryan Wynter, Paintings, Kinetics and works on Paper, 1915–1975, 5–30 August 1976, cat.no.41 (ill., pl.7) Sea Journey was first exhibited at Waddington Galleries in 1959. Michael Bird comments that the exhibition 'contained a series of virtuoso all over paintings in which this manner of working, popularly believed to be a chance-governed affair, attained classic status' (Michael Bird, Bryan Wynter, Lund Humphries, Farnham, 2010, p.119). Such was the impact of Wynter's exhibition that in reviewing the concurrent Abstract Expressionism blockbuster New American Paintings at the Tate, it was declared that there is just 'one serious challenge to American dominance of the London scene – namely, Bryan Wynter' ('American Explosion', Art and Artists, vol.1, no.5, May 1959). The 'classic status' awarded to these works is intertwined with the personal mythologies that surround Wynter himself. Greatly fabled is a practice he developed in the late 1950s of psychedelic self experimentation.Methodically he would set aside a twelve-hour window and dose himself with a carefully measured amount of prescribed mescaline. It would be foolhardy to suggest that Wynter's work of the 1950s is in anyway directly related to such experiments, however, his desire to challenge the accepted perceptual experience of life is a recurrent one; and one that is certainly palpable in the present canvas. Wynter was relentlessly curious and particularly when it came to visual experience. He was fascinated by stereoscopic photography's ability to transform two dimensional images into three dimensional spaces. Underwater photography was of great interest to him, indeed he constructed a home-made aqualung to explore the submarine world. In his own photography of the 1950s it was the textures and tones of nature provided by his Cornish surroundings which, through severe cropping, transform into abstracted compositions. 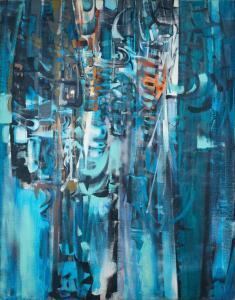 It is this cacophony of sensory experience which give rise to the aesthetic of his seminal late '50s canvases. The present example, resplendent in a particularly harmonious palette, is especially outstanding. The title informs us that we are entering an oceanic environment, yet it is suggestive rather than resolving. The rhythmically worked sprays of blue lifted with high notes of orange and ochre, pink and peach across a bold scale, are bewitchingly transformative. The result unquestionably achieves that which Wynter states is his ideal: 'to make paintings which throw off imagery of different kinds at different times to different people, continually unfolding different aspects of themselves, ambiguous and paradoxical paintings with no main 'theme', from which the spectator may, by participation, extract his own images.' (Bryan Wynter, Statements, unpublished, Loc.Cit.). signed and dated '48 gouache and watercolour 35.5 by 56cm. ; 14 by 22in. Michael Bird, Bryan Wynter, Lund Humphries, Surrey and Burlington, 2010, cat. no.3, illustrated p.13. The sheet has been laid down onto the backing board and adhered to the window mount. There is a light scuff or line of studio matter to the centre of the upper edge. Subject to the above the work is in excellent overall condition.The is window mounted and held within a painted wooden frame under glass.Please telephone the department on +44 (0) 207 293 6424 if you have any questions regarding the present work. "In response to your inquiry, we are pleased to provide you with a general report of the condition of the property described above. Since we are not professional conservators or restorers, we urge you to consult with a restorer or conservator of your choice who will be better able to provide a detailed, professional report. Prospective buyers should inspect each lot to satisfy themselves as to condition and must understand that any statement made by Sotheby's is merely a subjective, qualified opinion. Prospective buyers should also refer to any Important Notices regarding this sale, which are printed in the Sale Catalogue. NOTWITHSTANDING THIS REPORT OR ANY DISCUSSIONS CONCERNING A LOT, ALL LOTS ARE OFFERED AND SOLD AS IS" IN ACCORDANCE WITH THE CONDITIONS OF BUSINESS PRINTED IN THE SALE CATALOGUE." with Waddington Galleries, London, where purchased by the present owner, 1984.
, January 1964: this exhibition travelled to Toronto, Ontario, Art Gallery Of Ontario, January 1964; Montreal, Quebec, Montreal Museum Of Fine Arts, February - March 1964; Ottawa, Ontario, National Gallery Of Canada, March - April 1964; Winnipeg, Manitoba, Winnipeg Art Gallery, April - May 1964; Edmonton, Alberta, Art Gallery of Alberta, May 1964; Reykjavik, National Museum, June 1964; Regina, Saskatchewan, Norman Mackenzie Art Gallery, University of Regina, June 1964; and Humlebaek, Louisiana Museum Of Modern Art, September - November 1964.